I have been trying this socks for a few weeks now and before I tell you about them I wanted to tell you about Falke, as I had never heard of them before I was given these socks to try and test. 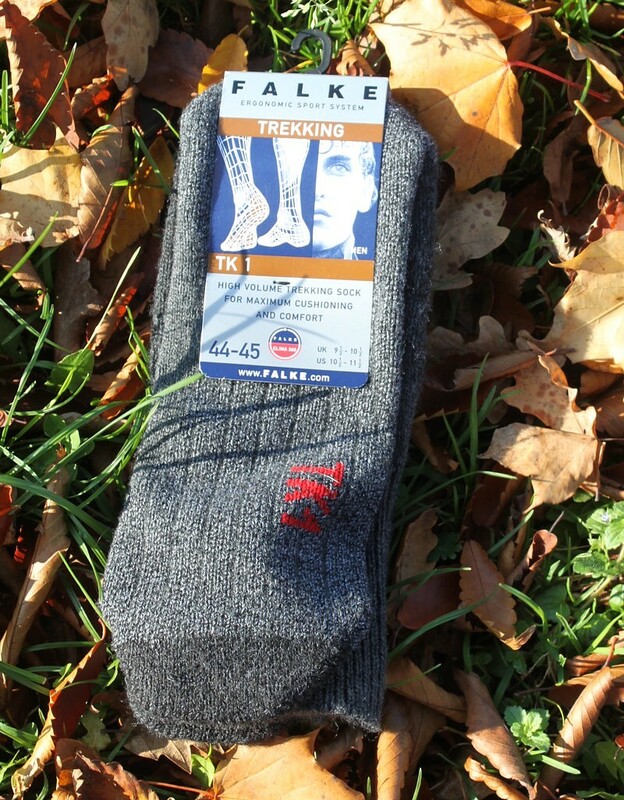 Falke make a vast amount of men and women’s clothing and as part of their vast range are their socks. Well what can I say I have never seen such a large selection of socks to choose from! They have 35 trekking socks just for starters, running socks, biking, cross-country skiing socks, motorcycling, tennis and much more. The sheer choice is truly amazing. Then on top of that they have various colour schemes for each sock. I am reviewing what they call the TK1 Wool sock and the only info they have online that tells you anything about the sock is ‘High-volume trekking sock with ankle, instep and achilles tendon protection’ which I would find a little disappointing if I was ordering online. The sock is made from ‘70% Virgin wool 30% Polyamide’ which I had never heard of before, but basically its wool that has not been recycled. This showed me a sign of quality that I had not previously noticed before in a sock. My usual trekking socks are either Bridgedale, Smartwool or Brasher and I was going to compare these with my new Bridgdale socks that I used last winter, so with my vast amount of experience hiking, trekking and climbing I was interested in trying these out. Firstly the socks come as usual attached to a folded laminated information card for hanging the socks in a shop. The info card tells you some information about the sock includes washing instructions. These socks sell for £17.00, and looking at Taunton Leisure for comparable prices these are the top of the range for price. The first thing I noticed was they were attached to the card by cotton thread and as you cut them free it pulls on the wool and I managed to produce a wool loop so maybe the plastic attachment tags would have been better, or more care on my part with my monster fingers. When your spending that amount of money small things like that are more apparent. Anyway not the end of the world. Taking the socks out you can feel the quality of the wool and they look very well constructed, they have a elasticated feel to the calf and a constructed heel and toe area. Not sure how they claim an achilles tendon protection, and as I years ago pulled them wearing mountain boots, I really don’t think they would offer any protection. If they mean from the cold, then maybe a slightly different wording would be good. So, after taking them out, I tried them on and they seemed rather large, and didn’t fit snuggly, I’m a size 11 and these were stating max 10 ½ but I suppose to keep the foot warm they need to trap air. I have tried these socks on with normal hiking trainers and then hiking boots and they are very warm and will definitely keep for your feet warm in cold conditions around zero degrees. If you suffer from sweaty feet not sure if these might be too warm, but it always depends what environment you try these on. Most of the temperature range I tried them on were 5 – 10 oC. Sadly one bad point and I think this is common in some thick wool socks, they produced a fold in the sock on the heal and another one underneath, and after a short distance had to stop and pull the sock up and retighten the boot. This is something I would just not tolerate from a normal pair of socks let alone a high end priced hiking sock. I have used Smartwool Mountaineering socks in the Alps and they have never done this. So I thought I would wash them and try again, but again they managed to produce a fold in the sock. Apart from that they are a great sock, warmth is amazing, and the feel of the wool is quality. They even tell which foot to put them on !! The sock is well constructed and looks like it would last a long time, I have washed them a few times and no sign’s of bubbling or wear. Just a real shame about the folding as it would cause discomfort and lead to bruising.